If people bring up a mental image of diamonds, then they no doubt picture clear, sparkling gems that shimmer and shine and capture the light in mesmerizing ways. In general, people who are shopping for diamond jewelry are looking for the stone that is the most brilliant and clear and rarely think that there is another type of diamond to consider. 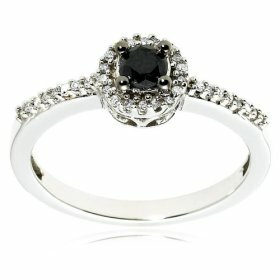 But the black diamond is another type of the precious gemstone that is becoming more popular. There was a time when a diamond of this darkest color was considered to be damaged, flawed, imperfect and virtually worthless. But that opinion has changed significantly and black diamonds are quickly becoming one of the unique league of gems that are being more and more sought-after, precisely because of their rarity and their exquisite uniqueness. For those who think of the typical diamond jewelry and fashion jewelry bling that incorporates standard diamonds as just “ordinary,” a black diamond may be just the thing they are looking for to set themselves apart. While it might seem odd to characterize any kind of fine jewelry that features a radiant diamond as common, when trying to stand out from the crowd these days, black diamonds can help do just that. If you are in the market for black diamonds, then you should know that they are not all “created equal” and some care and attention needs to be given to the various characteristics of this unique gemstone. As with any type of rare gem, it is important to be sure about the quality of the stone before making a purchase. First of all, it should be known that black diamonds can vary in color and might appear to be light gray or smoky, dark gray or pure black. What give these diamonds their tint and smoky color is inclusions of various types of minerals in the stone. The most common mineral inclusions in these black beauties are various iron oxides, such as hematite, sulfide, or magnetite. The higher the concentration of oxides, the darker and richer the tone, from a light gray all the way to black. This tinting is caused not by impurities, but by the inclusions, and black diamonds are typically opaque. However, there are some specimens that are semi-transparent or even translucent, and these are extremely rare and even more valuable. Carbonados are a classification of black diamonds which have virtually no value in terms of the gem in the jewelry industry. Even though they might be labeled as black diamonds, carbonados are very porous and they are much more common, and therefore carry less value than the gem-quality stones. In fact, the most common use for carbonados is as an abrasive and they are often used to cut and to shape the high-quality diamond stones. Because a gray or a black diamond is still quite a rare sight in the fine jewelry market, they tend to be very expensive. In order to reduce the cost in a piece of jewelry such as a diamond engagement ring, the main stone could be one of the rare black gems with other smaller, clear accent stones surrounding it. This not only provides for a less expensive way to enjoy black diamonds, but such a setting will also help to accentuate the unique beauty of this rare stone. This entry was posted in Diamond rings, Jewelry engagement rings, Wedding engagement rings and tagged black diamonds, diamond engagement rings, engagement rings, wedding rings on April 2, 2009 by Donald.